Carter Verhaeghe is more well-traveled than most 22-year-old hockey players. Originally drafted by his hometown Toronto Maple Leafs in 2013, Verhaeghe has been traded twice and split the last two seasons between the ECHL and the AHL. 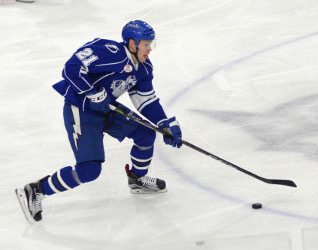 Verhaeghe believes his experience has helped mold him into a nearly point-per-game player this year for the Syracuse Crunch. "I've been through a lot in my short career so far, and I think that only helps me," Verhaeghe said. "I've played for a bunch of different coaches and different teams, and I think everything has contributed to the player I am now." After missing the first month due to injury, Verhaeghe has recorded eight goals and 19 assists in 33 games with Syracuse this season. The forward recorded at least a point in all 12 games between Dec. 2 and 31, the second longest streak in the AHL this season. For Crunch head coach Benoit Groulx, Verhaeghe's best asset is his ability to slot in anywhere in the lineup. "What I like is that he's a versatile player," Groulx said. "He can play left wing, right wing with different guys. He adapts well. You like players that you can move around in the lineup, especially in this league those guys are useful." Dealt to the New York Islanders organization before the start of the 2015-16 season, Verhaeghe registered 15 points in 30 games with AHL Bridgeport and 25 points in 20 games with ECHL Missouri during his rookie campaign. He followed it up with 29 points in 45 games with the Sound Tigers and 32 points in 16 contests with the Mavericks last season. "I've always had to prove I belong in this league," Verhaeghe said. "I thought I belonged in it last year and I got sent down, and I had to work my way back up. I've been constantly having to do that." Verhaeghe was at an Islanders development camp last July when he was notified he was traded to the Tampa Bay Lightning organization for goalie Kristers Gudlevskis. "They called me into the office and told me I was traded," Verhaeghe said. "I was excited. I thought it would give me a new opportunity. Someone else wanted me, so I was excited about that and looking forward to a new opportunity." Verhaeghe returned to Webster Bank Arena, the home of the Sound Tigers, for the first time Sunday. With a little extra energy in his game, Verhaeghe and the Crunch pulled out a 3-2 victory. "It was definitely weird. I saw a lot of familiar faces," Verhaeghe said. "I played that building for a couple years, so it was weird being on the other side, but it was nice getting the win there against my old team." While there's certainly room for improvement, such as increasing his speed and being stronger on the puck, Verhaeghe sees his game moving in the right direction. "I feel like I keep on getting better as the season keeps on going forward," Verhaeghe said. "I feel like I'm just trying to play hockey and be the best player I can be every day. Things are going pretty well right now and the team is winning. I think we have a good shot at the playoffs and in the playoffs to win something. "I'm just trying to work on it every day and keep it going." Pictured: Crunch forward Carter Verhaeghe leads the rush up the ice against the Rocket at the Onondaga County War Memorial Saturday.